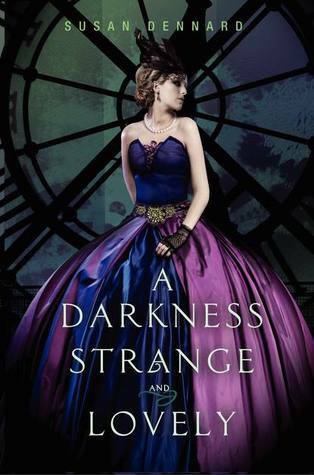 A Darkness Strange and Lovely is book two in the Something Strange and Deadly series. In this book Eleanor realises that in order to protect herself she needs to use her powers, but the more she uses her magic the more addicted she becomes to using her powers. We also get to see Elijah's demon friend, who I can't seem to figure out. Oliver was definitely in love with Elijah but I can't figure out whether Ollie is a good or a bad guy. At some points he seems like he truly cares for Eleanor but at other times it seems like he is only looking out for himself and that he has some secret motive. I felt really bad for Eleanor because she has so much going on with her. She's had her hand amputated, lost her brother and had to sell everything to pay for her mother's medical bills, a mother who has disowned her. On top of all that, Marcus is still after her and she can't help but feel the pull of her power, but the more she uses her powers, the farther away she is getting from the Spirit Hunters who hate all forms of necromancy and black magic. Plus, that iron fist at the end is definitely going to create problems for her, I can tell. Hopefully, the next instalment will come out soon and then we can find out what is worse than necromancy, whether the Spirit Hunters manage to find Jie and if Eleanor frees Ollie. "I'm serious. I've seen a lot of souls pass through my home, and I've seen a lot of loves still hanging on. Those long-lasting ones" - he tapped his heart - "are the ones filled with tenderness and smiles." "Oliver, the demon poet," I said drily. He rolled his eyes. "One last piece of advice, El: if this Spirit-Hunter does not love you back, then good riddance. Real love isn't about drama or heartbreak. Real love just is." She gave me a sad smile. "And she was like a sister to me-my closest friend in all the world. But...she died almost seven years ago." "Do not be. We must lose everyone we love at some point or another. C'est la vie." That is just a stunning cover. Glad to hear the book was just as good. I'll have to check out book one :) thanks for the heads up Zed!